IndiansinKuwait.com - Mavelikara Bishop Moor College Alumni to conduct College Alumni Fest "Kalalaya Varnangal 2019 "
Mavelikara Bishop Moor College Alumni to conduct College Alumni Fest "Kalalaya Varnangal 2019 "
Mavelikara Bishop Moor College Alumni Association Kuwait Chapter will conduct College Alumni Fest ‘Kalalaya Varnangal 2019’ on Friday, April 12 on the occasion of the Golden Jubilee of the college, organisers said in a press meeting. The program will be held at Jleeb Smart Indian School Auditorium at 5 pm onward. The‘Guru Vandanam’ dedicated to renowned cartoonist and former English Department Head of the college, Prof. V.C. John is the main program at the event. He will be presented a ‘Guru Shreshta Award 2019’ at the event. Prof. V.C. John, who hails from Kottayam Thazhathangadi became the foster son ofMavelikara when started his career as English teacher in the college in 1964. He has drawn over 20,000 cartoons. The cartoons which started in 1960 in K Balakrishnan’s Kaumudi still continues making a markin the cultural activities of Mavelikkara. 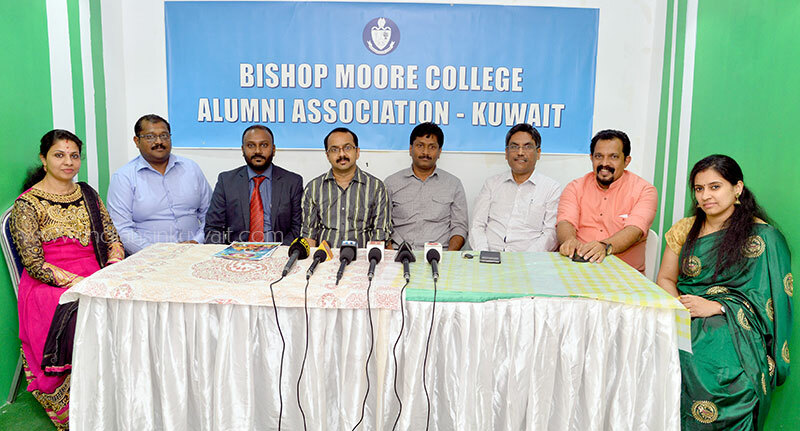 The Bishop Moor College Alumni Association Kuwait which started in 1998 was not very active, but has made a strong entry in Kuwait since 2013. The entry to the event will be restricted by a free pass. For more info contact 97542844,97542985, 65984876. Association President Manoj Parimanam, Secretary Babu Gopal, Vice President Lekha Shyam, General Convener Jerry John Koshy, Patron Sam Pynummoodu, Media & Publicity Convener Nissar K. Rashee, Pournami Sangeeth and Babuji Bathery were present during the press meeting.